When the Chinese basketball star arrived in America in October 2002, Houston Rockets owner Les Alexander said, "This is the biggest individual sports story of all time. Mark my words: in two or three years, he'll be bigger than Tiger Woods or Michael Jordan." Everybody laughed. But no more. Not only has the Rockets' 7-ft. 5-in. center changed the landscape of the National Basketball Association with his size and shooting touch, but his team-first attitude and self-deprecating humor have blown through the league like a gust of fresh air, reinvigorating a sport grown weary of spoiled, misbehaving superstars. All-American companies such as Visa, Apple, Pepsi and Reebok have flocked to seek his endorsements, making the Shanghai native, 23, the most recognizable Chinese icon since Chairman Mao. 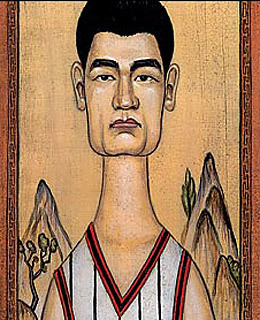 The Chinese are intensely proud of Yao, who has done the Confucian thing by living with his parents and sending polite holiday cards to his teammates and opponents, Shaquille O'Neal included. But few people outside the Middle Kingdom ever imagined how deeply a product of China's socialist sports system would capture American hearts. Earlier this year, Yao signed a deal with McDonald's, which had dropped its previous spokesman, Kobe Bryant. Kobe was supposed to be the next Jordan. Turns out the new Michael is a man named Ming.